What’s Next? 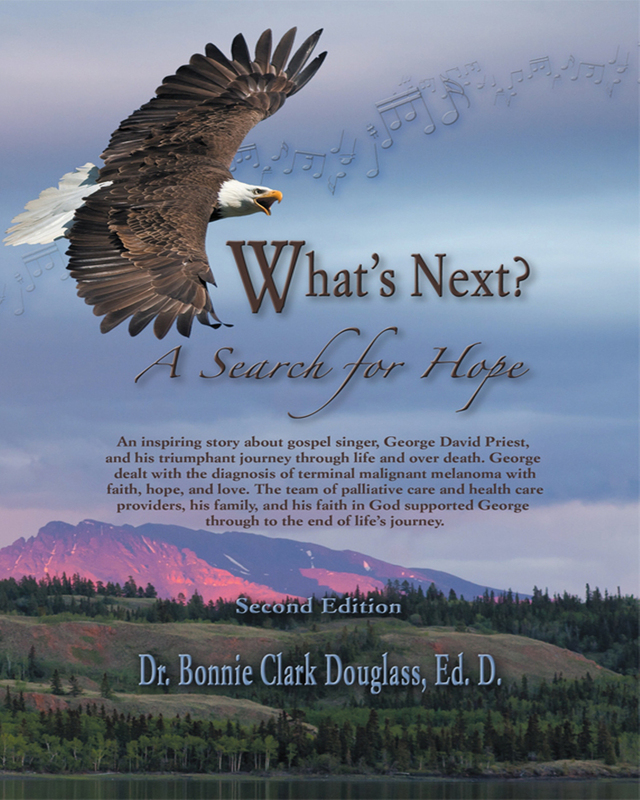 : A Search for Hope – by Dr.Bonnie Clark Douglass,Ed.D. Gospel singer George David Priest and his wife, Bonnie, were married just seven weeks when George was diagnosed with terminal malignant melanoma. In this remarkably poignant and heartfelt narrative, you will discover how their faith in God brings the light of hope while in the depths of despair. Personal conversations between George and Bonnie shed light on the differences between religion and a relationship with God. Their tale provides important information on prevention and treatment of malignant melanoma and palliative care options. “What an astounding book! I thoroughly enjoyed the references to Dr. Kübler-Ross which added to the discussion. Thank you for this intimate account of your life together with George, and the large part that God played in your lives. “Physicians must minister to the patient’s mind, body and spirit.” – Dr. John Seely, renowned Palliative Care Physician, and former Dean of Medicine. “I loved the book. Besides being an educational tool, it weaves a beautiful story of love, strength and spirituality. This book gave me a renewed sense of faith and its meaning.” – Kathy Kustra, MSW, RSW, Oncology Social Worker – Ottawa General Hospital. Keywords:- Malignant Melanoma, Grief Journey, Palliative Care Support, Physician Endorsed, Educational, Riveting, Hope. Genres:- Biography & Autobiography, General, Family & Relationships, Family Relation.